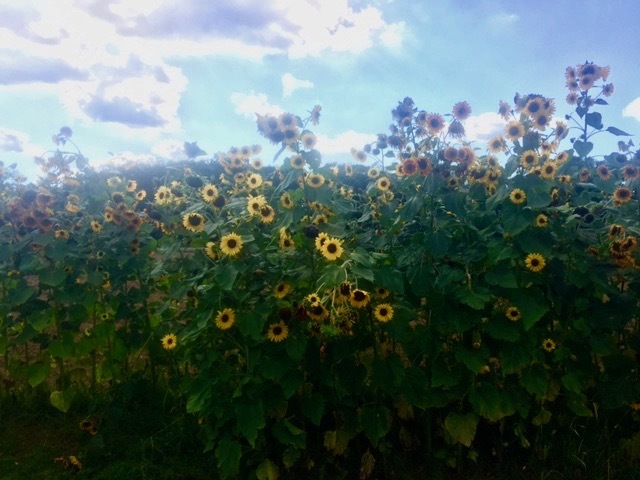 Sunflowers in Scobeyville, New Jersey. Two takes on the photographs, a history lesson, and some intoxicating discussion. We decided to stop at Delicious Orchards yesterday. I wanted coffee and to split a piece of their famous coffee cake, but Eileen had to have some gourds. Gourds have been around since 13,000 BC, but there still are a few for Eileen. They have a wide variety of gourds there in all shapes, but she was choosing from the small 6 inch variety. Not that she was out of her gourd, but she picked 5 of them in different shapes and colors. One of them seemed to have leprosy, with bumps all over its surface. 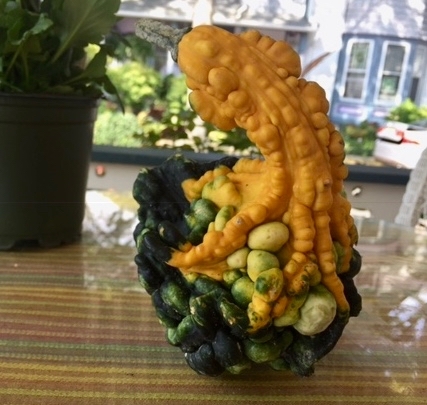 Even though I am the Dean of the Blogfinger Off-shore Medical School in Ocean Grove, NJ, I had never seen a case of leprosy, and I wanted to ship that gourd off to Johns Hopkins. 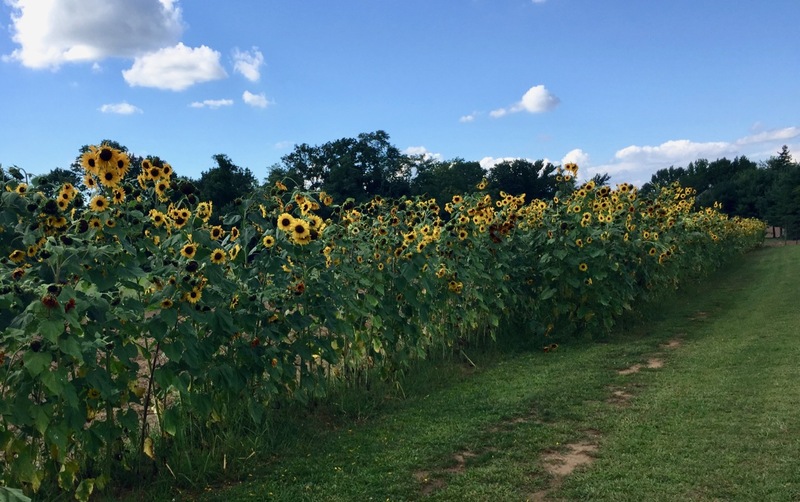 Anyhow, as we drove onto the DO property we spotted a long row of sunflowers in bloom. It’s the sort of incredible sight that you might see in France. Delicious Orchards is about 20 minutes away, allegedly in Colts Neck, on Rt. 34. Go there to see this sight and also to buy anything there with whipped cream. And their pies are something else. You see, they have a fabulous bakery there….it’s not all cucumbers, tomatoes and figs. So we parked our car, whipped out our iPhones and took some pictures. The lighting was very harsh and contrasty, so we obtained different results (see above). To avoid any charge of liking my pictures more than her’s, I decided to post one photo from each of us. Mine is a little more Van Gogh-esque, while her’s is more Andy Worholish. They have a coffee/snack bar and a juice bar there. And don’t miss the room that has chocolate, coffee, candy and even licorice. 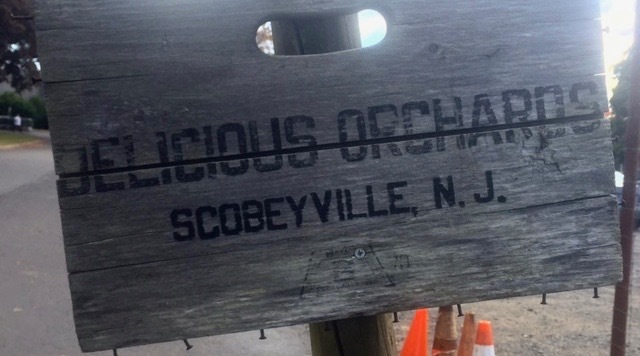 But, the funny thing is that while we were tiptoeing through the sunflowers, we came upon a sign (below) which said Delicious Orchards, Scobeyville, NJ. But everyone knows that DO is in Colts Neck. During prohibition, the Feds raided an illegal distillery in Scobeyville. Until recently, the only place in America where Apple Jack was made, was at the Laird family distillery. In Normandy, France, they make an apple brandy called Calvados. And the best apple cider (non-alcoholic). we have had is in Chester at the Hackelbarney Farm Cider Mill (worth the trip.) And you can hike through Hackelbarney State Park and visit the Nathan Cooper Grist Mill where you can get some grist to take home.